In our Kaleidoscope community, we call this the Scope It phase, where we gain self understanding, awareness and clarity. We gain an appreciation of our strengths, make peace with “weaknesses,” and become more hopeful as we begin to discover possibilities. We realize we are one, united in our quests for self-discovery, to answer the call and to do so in ways best for us as a sacred spiritual collective of soulful individuals. This quest and our journey Through the Kaleidoscope requires investments of time, energy and resources into our personal growth and spiritual development. We Scope It and see where we are now. We Scope It and decide where we want to be. We decide to close this gap, taking inspired and guided actions, to Shift It in the direction of our dreams. We take what works, Click It into place, adapt our best ways, as we reflect on what might be and feel even better! As we go back through the process, this reflection time reveals additional morsels about our motivations, thoughts, emotions and actions. As we reflect, our zones of genius and nuanced forms of creative expression are more readily revealed. refine and reimagine our most vibrant lives. If you find yourself feeling overwhelmed, scattered, lost and adrift, Reflect and Reveal personal power, possibilities, clarity and confidence. In a rush? Feel like time is slipping away? Reflect and Reveal your proper pace. Feel like you’re pushing, forcing and not seeing results? Reflect and Reveal freedom and flow. 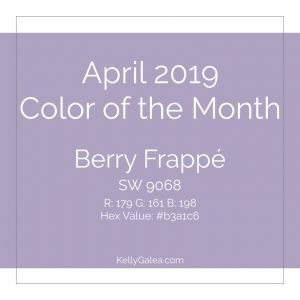 Use the vibrations of our color of the month, Berry Frappé, to scope, reflect and reveal your potential, passions and possibilities. Use it as you Reflect and Reveal your personal power, purposeful path and priorities. Tap into its energy as you Reflect and Reveal your more vibrant life! Colors selected to represent the energy of each month and each week of the year are Sherwin Williams colors. Their architectural and design palette has been my go-to for years! You see the color above, along with the Sherwin Williams paint code plus the RGB and hex code equivalent values. This helps if you’d like to use these colors in your physical space, on your desktop or as you Reflect and Reveal your most vibrant life this month.